Aizawl, Feb 5 : Major NGOs of Mizoram on Tuesday sent a memorandum to the Chief Election Commissioner of India, informing him of the NGOs' intention to take steps to delete the names of the Bru refugees living in Tripura relief camps from the Mizoram electoral roll. The memorandum informed the CEC of the resolution of the joint meeting of the central Young Mizo Association (CYMA); the Mizo Elders' Association (MUP); the Mizo Women's Association (MHIP) and the Mizo Students' Association (MZP) on January 28. The resolution had urged the state government to make efforts to repatriate all the Bru families, "who have on their own accord fled from Mizoram" in 1997 and who continue to chose to live in transit camps in Tripura under "various pretexts", by February 2014. The meeting resolved the joint NGOs shall take all the necessary steps for deletion from the Mizoram electoral rolls the names of those electors who are unwilling to return to Mizoram by end of February, 2014. 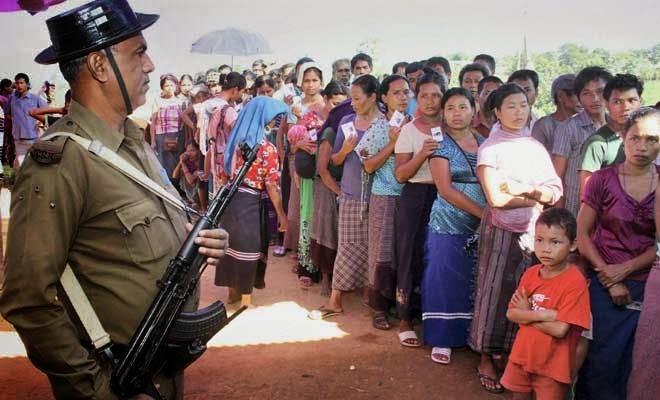 "That the joint meeting of all the NGOs fervently requests the Election Commission of India to seriously take into consideration the opinion of the people of Mizoram in all its future dealings with the Bru refugees on matters of Electoral Rolls revision, omission and commission," the memorandum stated. The Mizo NGOs' hostility towards the Bru refugees was fueled by the kidnapping of three persons - a telecom professional from West Bengal and two Mizo drivers - from Mizoram on November 23, 2013 by National Liberation Front of Tripura, with the help of Bru militants. The NGOs felt that the Bru camps not only served bases for Bru militants who occasionally committed crimes in western Mizoram. While the two Mizo drivers were freed on January 21, the telecom professional Deep Mandal is still being held hostage in Bangladesh jungle as the militants demanded huge amount of money from his employer for his release. Young Mizo Association (YMA) today decided to visit the border village of Tuipuibari tomorrow to secure the release of Deep Mondal, who was abducted by suspected militants two months ago. Volunteers of the association have threatened to enter Bangladesh to search for Mondal, a telecom professional, , who has been in captivity in Bangladesh since November 23, a senior official said. The “search party” to secure the release of Mondal, comprising YMA leaders and members, today met at Damparengpui village on the international border in Mizoram’s Mamit district. The district superintendent of police Rodingliana Chawngthu said around 100 “search party” members were planning to go to Tuipuibari tomorrow. Chawngthu said no law and order problem has arisen so far and there has been no report of Bru people leaving the state for fear of communal backlash. While two Mizos abducted by armed Bru goons and kept hostage for ransom were released on January 21, Mondal continues to be in captivity.